Shop Local and Support our Sponsors! 1. Keep Money Local—Sales taxes fund our communities and provide vital services such as police and fire protection, street repairs and trash collection. Local businesses are more likely to shop with other local businesses, keeping money moving in our local economy even longer. 2. Local Investment—Local businesses are less susceptible to national downturns and more likely to work harder to stay open. Local ownership means that important decisions are made by people who live in our community and feel the impact of those decisions. 3. Locally-Made Products—Local business owners often sell local products, which helps preserve the community’s distinction and creates more jobs locally, as well. 4. Support for Nonprofits—Local businesses support good work in our community. Studies have shown that nonprofits receive 250 percent more support from small businesses than large ones. 5. Discover Interesting Things and People—One-of-a-kind shops and restaurants are part of what makes our city a great place to live. You have places that you cannot find anywhere else and that makes our community unique to us as well as outsiders. 6. Personal Connection—Getting to know the store owners is a great reason to shop local. It’s their business, they are the decision-makers and they build a personal relationship with their customers. 7. Product Knowledge—Local business owners are well informed about their products and know what they are selling. Because they know their customers, they can easily adjust their inventories to include the goods and services local people want to buy. 8. Diverse Products—Local stores carry inventory you might not find at national chain stores. 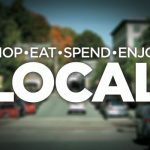 Local business owners choose products based on what their customers want and often carry unique items from local artists and farmers. 9. Cost Effective—Sometimes prices at local businesses are better because they don’t have the overhead that larger stores may have and they may be more willing to negotiate to meet your price needs. 10. Better Experience—Local shopping can translate to more convenient retail experiences. Most often it will take you less time to walk into a local clothing store than it takes to find a parking spot and walk the distance to visit a mall chain store. 11. Less “Leakage”—Local businesses tend to buy and sell with other local businesses. With national or multi-national firms, a percentage of that profit ‘leaks’ out of the community, the state or even the nation. 12. Increased Expertise—Shopping at a local store means you can get an expert opinion about the products that you’re purchasing because local shop owners have to be experts in their field to compete. Use them—ask them questions and get advice about products. 13. Create Community—We are a transitory society so people don’t always have a connection with the communities where they live. Visitors to an area should be able to ask locals where the best places are to eat and shop. 14. Better Service—Local business owners do what they do because they are passionate about their products and typically take more time to get to know their customers. They’ll often go the extra mile to help you and to ensure you’re a satisfied customer. 15. Support Future Growth—Our experts agree on the last reason—shopping locally is the best way to show pride in your city and help protect the businesses that make our city unique.